In April 2010 the DRCC held a General Meeting to discuss the proposed changes and revisions to the DRCC’s structure and Terms of Reference. The structure below highlights the two main groups being the Steering and Implementation Committee (SIC) and the Detroit River Public Advisory Council (PAC). The role of the DRCC Steering and Implementation Committee is to provide overall coordination and direction for the implementation of the Remedial Action Plan (RAP). The primary role of the Public Advisory Council is to provide a venue for the public to input into the Canadian Detroit River RAP process. The DRCC Framework and Terms of Reference is taken directly from the Detroit River Remedial Action Plan Stage 2 Report. Download the full report here. 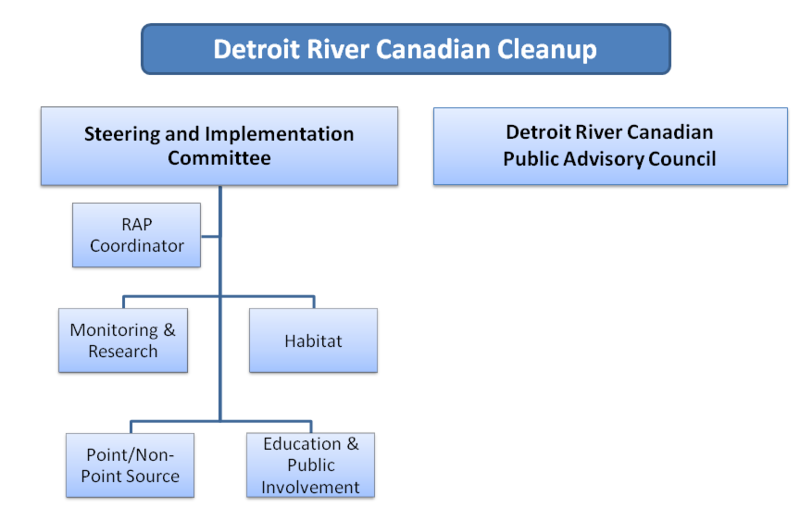 Organizational structure of the Detroit River Canadian Cleanup. Meeting records are available for all DRCC work groups. They are posted after they are reviewed and approved at the following meeting. Meeting records prior to 2010 can be provided upon request. *Note: the Monitoring and Research & Habitat Work Group meeting records can be made available upon request by contacting the Detroit River Remedial Action Plan Coordinator, Claire Sanders at sanders@detroitriver.ca.